History is made to be learned from, even in terms of wellbeing and beauty. 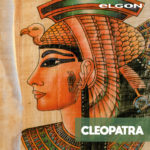 Cleopatra, the Queen of Ancient Egypt, is a woman from the past who has always been a symbol of beauty and sensuality. A confident, seductive, intelligent and highly alluring figure. Cleopatra is a myth to all intents and purposes. Like all women, she had her beauty secrets, which have lived on to the present day. The cult of haircare seems to be well and truly rooted in Ancient Egypt. The first ever specialist trichologist is believed to have been an Egyptian who lived as long ago as 4000 B.C. Hygiene and appearance were essential to this civilisation: cleanliness of the body was akin to cleanliness of the soul. As demonstrated by the discovery of several mummies, Egyptian women used to color their hair with various henna concoctions. In fact, hair coloring was already recognised and employed in Ancient Egyptian times. Even Cleopatra, the last queen of Egypt, would dedicate several hours a day to her beauty regime and she always had impeccable braided hair embellished by precious decorations. In terms of her haircare ritual, Cleopatra would alternate salt treatments to lighten tone with a healing wash made from eggs and water, to keep her crowning glory soft and silky. To maintain their lengths, Egyptian women would apply safflower powder and snake oil; to restore damaged hair, they resorted to Greek hay fortified by lion fat; while to define their hairstyles, they used beeswax and gum arabic. Today, women have a vast choice of professional products available to keep their hair looking both beautiful and healthy, and feel like royalty, just like Cleopatra. Elgon is the perfect ally of women who know what they want, love to feel great, and are free to express their individual personalities. For those who love to change the color of their hair and express themselves in this way, Elgon offers an extensive shade range with its Moda&Styling, I|Care and 10MIN color lines. Our Argan Supreme Oil is the one product that radiant hair mavens cannot live without. Our four-phase reconstructing Link-D treatment instead offers the perfect solution for those who need to regenerate stressed and damaged hair. Last but not least, our ultra-strong Fix It! lacquer is the must-have product par excellence for impeccable styling.